The National Law University, Delhi hosted its first Convocation ceremony on 15th June, 2013 at Vigyan Bhavan, New Delhi. 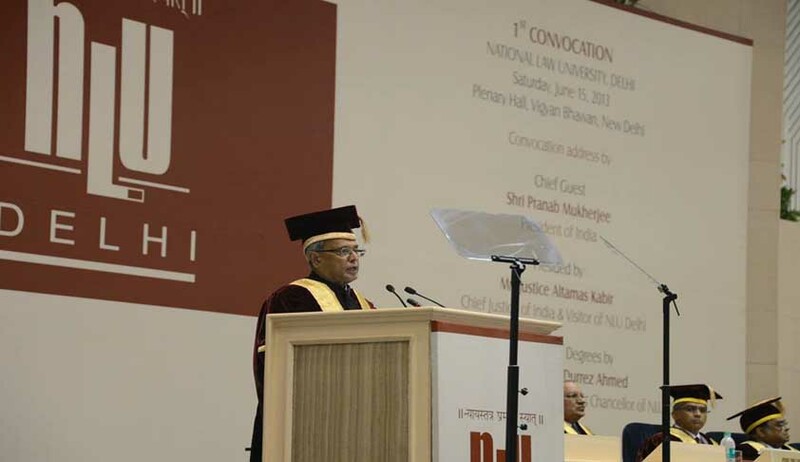 President Pranab Mukherjee delivered the convocation address and Chief Justice of India and Visitor to the University, Justice Altamas Kabir presided over the function. The degrees were conferred by Justice Badar Durrez Ahmed, Acting Chief Justice of the Delhi High Court and Chancellor of NLU Delhi. Justice Dalveer Bhandari, Judge, International Court of Justice (ICJ) & former Judge, Supreme Court of India; was conferred with LL.D. (Honoris Causa). Justice Bhandari is the fourth Indian to be appointed as a Permanent Judge at the ICJ. 71 candidates were conferred with B.A, LL.B. (Honours) degree and 15 candidates were conferred with LL.M. degree. 2 candidates were awarded Ph.D. President Pranab Mukherjee presented the gold medals to various candidates. You can read the entire Convocation Address here.